Investigating the powerful new SATRA TimeLine2 management system tool. 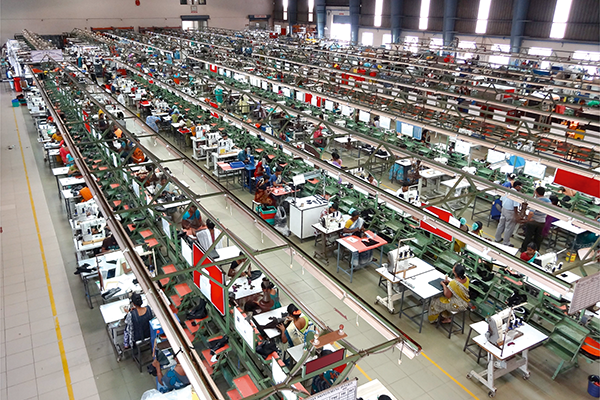 One of the key objectives at SATRA is to help the footwear industry to improve productivity. 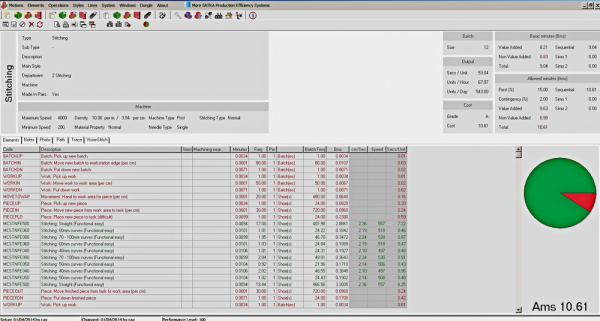 In 2013, the SATRA TimeLine database and configuration tool was launched, that enables manufacturers to calculate the optimum time required to carry out virtually any shoemaking operation. These times provide data for labour costing, planning production, line balancing and machine utilisation requirements. There are a number of benefits to using SATRA TimeLine, including the detailed analysis of process time in manufacturing sequences. Virtually all shoemaking operations can be identified and changes quickly made when new styles are introduced. In addition, factory planning engineers are able to configure ‘virtual’ production options to determine what is required in terms of operators, plant and equipment before laying out the physical production line. The system enables manufacturers to schedule or load the production processes more efficiently. By listening to SATRA TimeLine users, we have improved the package and a new version – SATRA TimeLine2 – has been released. 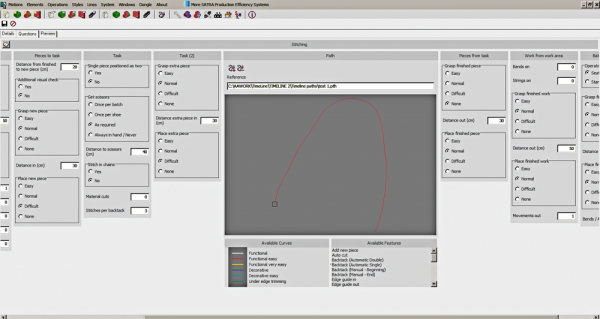 This contains more features and allows the user to customise the software to a particular product. SATRA TimeLine2 has now been installed in companies in China, India, Indonesia, Korea, Portugal, Slovakia, Thailand and the USA, with further installations planned for Vietnam. The question screens (‘definitions’) have now been split into ‘handling’ and ‘task’ screens, thus making it easier to combine various handling methods with different tasks. In addition, a change has been made to the previous limit of 26 questions per screen, making them now almost limitless. The new question screens (figure 1) allow distances, speeds and procedures to be entered easily and quickly into the system, thus eliminating the need to continually create detailed elements for a task. Standard (pre-determined) times have been identified for all motions required to complete any task, with these motions forming the 'building blocks' of SATRA TimeLine2. Examples include times for free hand motions (for instance, when moving to pick up a brush) and restricted hand motions (such as when accurately cementing along an edge with a brush). Users now have the facility on most question screens to use an ‘internal’ digitiser to enter hand movements and features on the path, as well as types of stitching (for example, attaching or decorative). For more complex paths, the ‘external’ supplied digitiser can be used. Multi-machine operations – such as sole pressing and backpart moulding – can now be calculated, taking into account the overlapping machine/operator times. The user will be trained to create his or her own question screens for operations that are not included in the system. These can then be exported to other databases if the user has factories in different locations that are not connected to the same database. SATRA TimeLine2 enables factory production planners to not only produce reliable and realistic direct labour times (and, therefore, a cost) for each operation (figure 2) based on the expected method, but also quickly evaluate any proposed variations. It is often possible to improve the way the product is made and how the production line is planned, laid out and balanced, in order to reduce operation times. The effect on overall efficiency can be considerable, and we have examples of significant improvements in total process time on the whole line when using SATRA TimeLine2. A key aspect of SATRA TimeLine is the opportunity to examine the balance of value-added/non-value-added aspects for each operation, and to identify unnecessary movement or inefficient working methods. 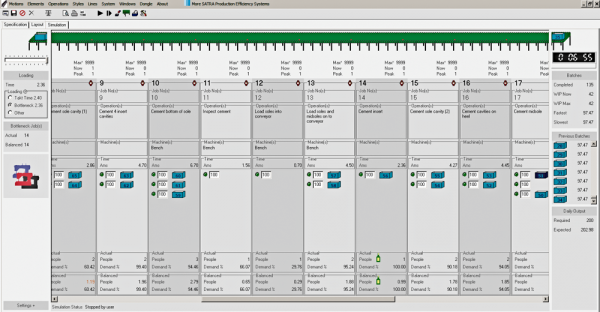 SATRA TimeLine2 will also provide production management with a detailed operation analysis to assist with training and monitoring production efficiency. The system screen provides visualisation of the process sequence, enabling the user to run a theoretical production line (figure 3) before committing effort to the real thing. Potential production holdups, slow processes and imbalances can be quickly identified, after which the user can easily reconfigure the layout and check to see if it is improved. SATRA TimeLine2 is equally applicable to manufacturers regardless of size, methods, machinery used, fashion content or product price bracket. At the core of SATRA TimeLine2 is a well-established, predetermined international time system that identifies the time required to complete simple actions. 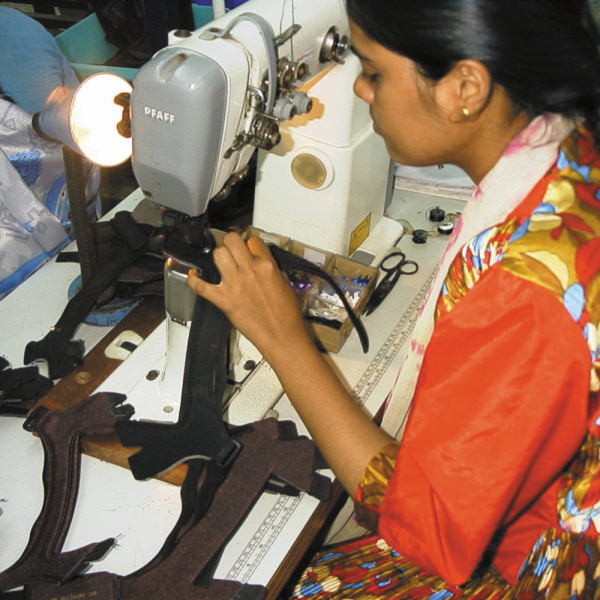 This has been combined with the times required to carry out typical shoemaking operations based on decades of SATRA’s own research. SATRA TimeLine2 can be connected to various information technology systems and also incorporates the facility to output data to other costing-based programmes. SATRA TimeLine2 combines the above-mentioned internationally recognised time measurement principles with SATRA-derived research and experience of optimising manufacturing processes within the footwear industry. Work operations are broken down into a set of basic motions, such as ‘move’, ‘grasp’, ‘position’ and ‘release’, and standard times for each motion are calculated based on industry best practice. Each of these ‘elements’ is allocated a time based on the action plus the distance travelled. These have been coupled with specific machine operation times which have been developed from extensive research carried out by SATRA. They provide an unparalleled level of accuracy for understanding the optimum time required for all shoemaking operations. Typically, our consultants find that factory values are often based on inaccurate timing methods. In addition, methods and procedures often get changed without re-evaluating the effects on operation time. The result is an inaccurate predicted manufacturing time, leading to poor cost control and inefficient production. The SATRA TimeLine2 package consists of a number of options, depending on the level of expertise of the factory production planning team. The general starting point will be 'entry level', consisting of a period of system installation, familiarisation and training. The factory will then be provided with an 'action plan' – a four- to six-week period for more familiarisation of the system and data creation (which can be sent back to SATRA for off-site analysis). SATRA will then visit again to provide further training, confirm competence, check method statements and work place layouts. For organisations wanting to further explore the principles of factory planning and work study, SATRA has an advanced level training programme available. We recognise that not all factories are familiar with work-study techniques, and it may be necessary to provide operatives who have a basic knowledge with a pre-entry level appreciation course before commencing general SATRA TimeLine2 training. Any requirement for this will be determined by a test before starting entry-level training. SATRA TimeLine2 has been specifically developed for use with other SATRA management systems, such as SATRA VisionStitch and SATRASumm. These, coupled with our comprehensive and unparalleled knowledge of shoemaking, operations makes the system unique. An insock assembly line – consisting of ten operatives covering five operations – was investigated during a SATRA TimeLine installation. When analysed, the operatives working on the final operation, who were supposed to only pack the completed socks in ten-pair bundles, actually spent considerable time cleaning off cement and trimming the sock foam due to additional operations that had been added to overcome production problems. This led to a total review of the whole line, looking at methods, materials and layouts. Using SATRA TimeLine, different scenarios were quickly compared, which resulted in a new layout and efficient methods being implemented. This produced a reduction in the operators required – five instead of the original ten – but with the same output. The methodology that SATRA TimeLine imparts on the user is to question everything and to consider the whole sequence of operations. Some processes can be eliminated, combined or improved. Effective methods can be installed, and the time taken at all stages can be calculated and compared. SATRA TimeLine2 is an enhanced version of an established product based on tried and trusted production efficiency methods derived from SATRA’s research developed over many years. Exclusive to members, SATRA TimeLine2 provides a sophisticated tool to manage all aspects of labour cost control, as well as monitoring and improving manufacturing productivity. The system can be installed in member companies, and supported by a comprehensive consultancy and training programme. Please email systems@satra.com for further information on how SATRA TimeLine2 can help to improve the control of your labour costs and manufacturing productivity. This article was originally published on page 48 of the July/August 2015 issue of SATRA Bulletin.